We are in the process of designing and implementing a permaculture / regenerative agriculture / woodland master plan for this acreage in conjunction with Mark Doucette and Hannah Blankenship of Wassail Land Care and the Northwest Natural Resource Group (the latter, a conservation and rural economic development non‐profit organization based in Seattle, Washington). The sketch above is a rough draft (March 2019) the work in progress. This long term effort will help to improve soil health, protect critical wildlife habitat and bolster resiliency of the land and its future inhabitants. 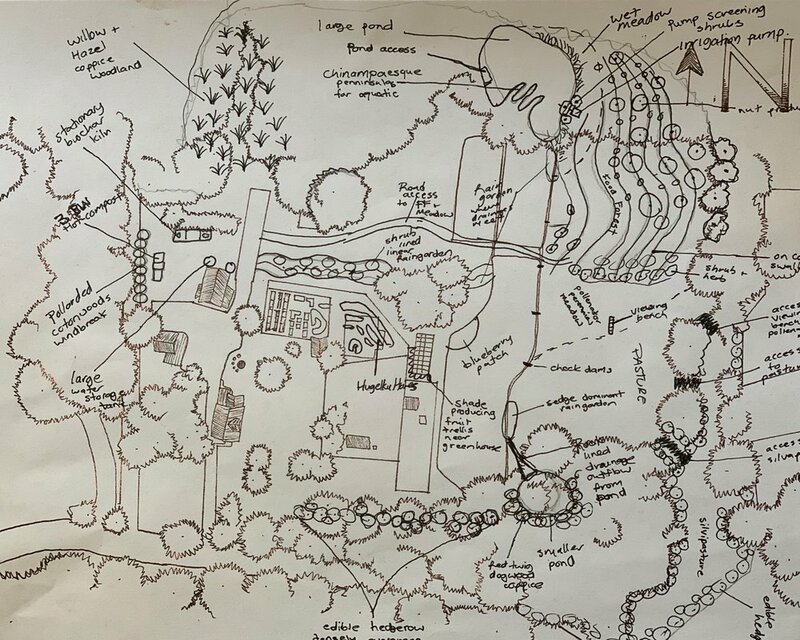 Permaculture design concepts are being applied to the main homestead area and include food forests, hugelkultur beds, swales, rain gardens, rain water storage tanks, increased shade from fruit and nut trees, silvopasturing, pollinator meadows, coppicing, biochar production and hedgerows. Carbon farming will be a foundational component to our soils approach, allowing the woodland and agricultural areas to exist in a mutually beneficial relationship. Wildlife habitat will be preserved and enhanced with this holistic, closed loop systems approach.